Go to original pattern for design DROPS 48-7. DROPS 2.5 mm [US B] and 3 mm [US C] crochet hooks, or sizes needed to obtain correct gauge. 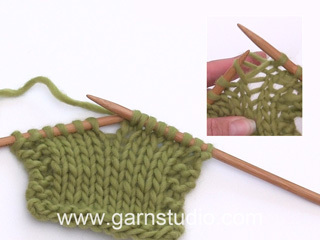 DROPS 3.5 mm [US 4] double pointed needles, or size needed to obtain correct gauge. 8 DROPS buttons (Buttons no. 117K). EDITOR’S NOTE: Due to the possibility for error in rounding the conversion of this gauge, I strongly recommend that you use centimeter measurements in order to obtain the correct gauge. 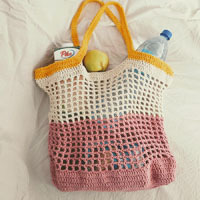 Knitting gauge:	23 sts x 30 rows in stockinette st = 10 x 10 cm [4" x 4"]. Pattern: See charts. (1 chart = 1 repeat). The pattern is seen from the right side. Back: Ch 168 (192) with larger hook and work Pattern 1. When 13 (14) vertical repeats (of rows 3 through 7) have been worked (the work measures approx. 43 (46) cm [16-7/8" (18-1/8")] - shape armholes by working over only the center 10 (12) horizontal repeats. Then, when 21 (22) vertical repeats have been worked (the work measures approx. 69 (73) cm [27-1/8" (28.75")] - shape shoulders by working over only 3 (4) horizontal repeats at each side - the center 4 repeats are for the neck opening. Now 22 (23) vertical repeats have been worked and the work measures approx. 72 (76) cm [28.25" (29-7/8")]. Right front: Make the back first. Ch 84 (96) with larger hook and work Pattern 1. When 13 (14) vertical repeats have been worked (the work measures approx. 43 (46) cm [16-7/8" (18-1/8")] - shape armholes by working over only the 5 (6) horizontal repeats on the right side (= armhole on the left side). When 5 vertical repeats remain (the work measures approx. 56 (59) cm [22" (23.25")] shape neck as follows: On the first row do not work the outermost horizontal repeat on the right side. Complete that vertical repeat, then on the next row do not work the outermost horizontal repeat on the right - now 2 repeats have been "bound off". Work until length is the same as the back. Left front: Crochet like the right front, but reverse all shaping. = 132 (132) sts. When the work measures 42 (36) cm [16.5" (14-1/8")], bind off 2 sts each side of marker and knit the rest back and forth on the needles. Bind off at each side for sleeve caps every other row: 3 (2) sts 14 (19) times, bind off. The work measures approx. 52 (49) cm [20.5" (19.25")]. Assembly: Sew shoulder seams. Work a row of sc in the back neck opening. 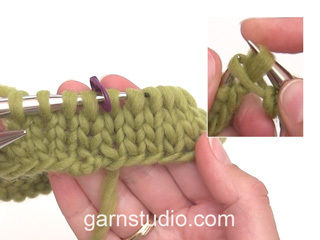 Starting at the lower edge of the body, work a row of dc along the button band and around the neck with smaller hook: approx. 130-140 sts along the button band, approx. 150 around the neck and approx. 130-140 sts along the button band and then around the bottom edge of the body. 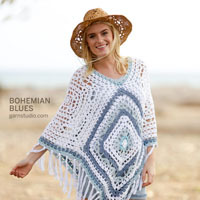 Then crochet a border up along the button band, around the neck and then down along the other button band as follows: * ch 3, 1 dc in the first ch, skip over 2 dc and work 1 sc in the next dc *, repeat from * - *. 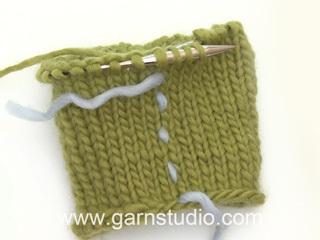 Repeat this border around the bottom edge of sleeve. Work a row of approx. 160 dc around the armhole with smaller hook. Sew on the sleeves so that the dc around the armhole are on the outside. Sew on the buttons. 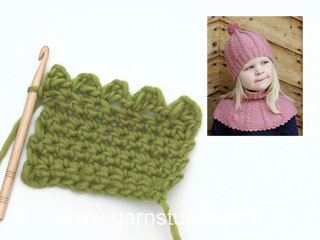 Use the outermost crocheted border as buttonholes. What is chart M.2 for? I can't figure out what it is. 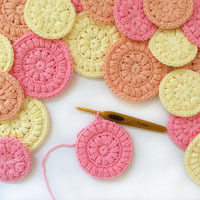 Dear Mrs Meyers, Diagram M.2 is worked for sleeve (= sleeves are knitted in the round with double pointed needles size 3.5 mm). Happy knitting! 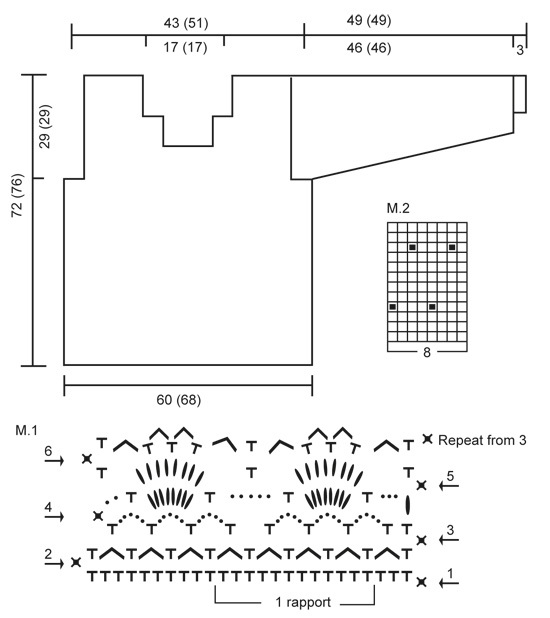 The english translations for the Diagrams for all Garnstudio patterns are included within the text of the Pattern itself. If you look in the text, you will find lines starting with an = sign. These are the translations, and they are given in the same vertical order as the chart symbols within the diagram.